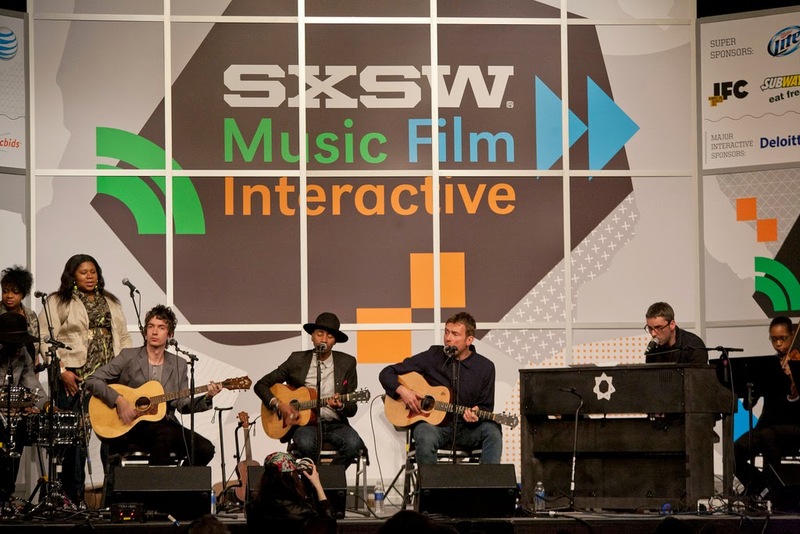 WFUV has posted the entire set from Damon Albarn's appearance at the Public Radio Rocks showcase during SXSW. He played new songs from his upcoming solo album, Everyday Robots, due in April. (Check the song "Lonely Press Play" and learn more about this at a previous post here.) Albarn set up to rehearse with local talent and let it rip, calmly in command of the new songs with a ease of a seasoned performer and musician. Listen to the entire set and see photograph gallery here and watch videos for "Mr. Tembo" and "Heavy Seas of Love" below. "Heavy Seas of Love" closed the set, a sweet tune that exists as a duet with Brian Eno on the album. Here Albarn sings both parts, but I can't wait to hear that version with my pal from our Asheville airport encounter. There are also sets by The Hold Steady, Temples, Phantogram, Jeremy Messersmith and Lucius all streaming here, along with more exclusive videos.